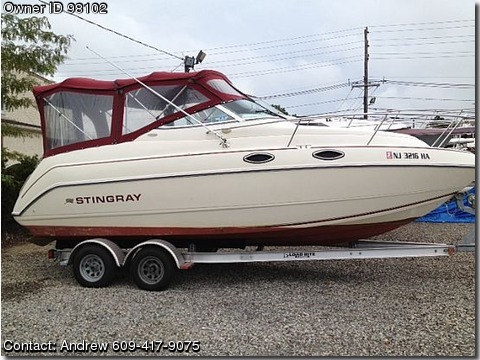 Please contact boat owner Andrew at 609-417-9075. 2010 loadrite trailer, small galley with alcohol burner, ice box. head with a porta potty and shower. Seats in great shape. 2 year old exaust risers. new water pump. Alot of boat for the price. SS prop with a spare SS prop, Carry- on AC unit, brand new Lowrance Elite 4 HDI FISHFINDER/ chart plotter. BBQ , shore power, dual battery charge minder, new wash down pump, Coast Guard package. Boat was professionally surveyed in 2012. Boat is in the water now!